One of the more daunting things for people just getting into tabletop wargaming is where to start. There are countless systems to choose from, many scales, different levels of complexity and hundreds of thousands of products to choose from. Shopping online or walking into a local hobby store, the newcomer can easily be overwhelmed by the sheer quantity of “stuff” that’s out there in the hobby. Here’s a few pointers on how to get yourself (or your kids) started. 1.) Try a game first. If you have an opportunity to try a game before buying, that’s the best (and cheapest) first step. Spending a few hours with a local gaming club, visiting a gaming convention or playing at a nearby hobby shop will give you a broad overview of how complex and fun a game can be. It’s also good to speak with other players so they can relate their personal experience in what they do (or don’t) about particular games, and what kind of a time and money commitment you may be making by undertaking a new game. 2.) Pick a theme. There is a tremendous variety in the playable world of gaming. If your kids like comic book superheroes or sci-fi space battles, there are games for those. If you like reading about history and are interested in playing a particular historic era, chances are there’s a game for it. If you have tendencies toward swords, sorcery and fantasy monsters, there are plenty of options. And, for those of you into horror and zombies, there are definitely games to suit your taste for the macabre. 3.) Visit a local store. It’s great to support local businesses, and getting to know the folks at your local hobby store, comic book shop or specialized wargaming outlet is key to your intro and growth with a game. People at these stores are usually gamers themselves, and they know and love this stuff. Be honest with them when just starting out. Explain your level of previous experience, interests, budget and the amount of free time available to play games. If you are looking to play a World War II game for a couple hours a week and have a budget of $50, they’ll probably steer toward the great board or card games available. If you have hours of free time and are willing to invest hundreds (or thousands) of dollars in a World War II game over the long term, a good store employee will point you in a different direction. 4.) Get a starter set. One of the great things about wargaming is the wide array of products the industry churns out. Settling on just one gaming system can present a new player with thousands of options. Experienced gamers usually go the a la carte route, picking and choosing the specific miniatures, models and rulesets they want. As a new gamer, however, what you usually need to get started is some miniatures and rules. Thankfully, many popular wargaming systems offer packaged starter sets. These usually contain a set of rules, dice, maps and enough miniatures to wage a small game right out of the box. The other bonus with starer sets is the costs savings, as many companies package there starter sets with contents that might be double the cost if bought separately. Here’s a couple of my favorite starter sets, covering a couple different scales and eras. If you’re looking a for a great wargaming gift this holiday season, start here. Flames of War: Open Fire! If you’re interested in World War II, start here. For about $70, this incredible set gives a player a 50-page quick-start guide, a full 300-page rulebook, dice, nearly 120 soldiers, eleven tanks and lots of other goodies. The set encourages you to glue up the miniatures and models and start right in playing. Once you’ve got a game or two under your belt, you can get started painting and then head back to the shop to start building out your forces for even bigger games. Millions of people are going to be marching into movie theaters this month to see The Hobbit: An Unexpected Journey. If your interest in things Tolkienesque goes beyond the Hobbit and Lord of the Rings books and movies, then Games Workshop’s line of games should be your next stop. To coincide with the new movie, a whole new line of miniatures, rules and this incredible limited starter set has been introduced. The set costs $125, but with that you get all the hero characters (Bilbo Baggins, Gandalf the Wizard and Thorin Oakenshield and his band of dwarves) and dozens of goblins. The set includes a 50-page rule book plus some terrain models, dice and a ruler. Everything is plastic and modelled with incredible detail and personality. When painted, the models really come to life on the table. There’s also a full line of Hobbit-themed (and previously-produced Lord of The Rings) miniatures and rules ready to be added to your future games. Games Workshop also offers two long-standing favorites in the miniatures gaming world: Warhammer and Warhammer 40,000 (or, 40K to fans). Each gaming system offers a starter set for $99 that comes packed with incredibly detailed miniatures, rule books, starter guides, dice and other gaming accessories. Warhammer is set in a fantasy world of magic and monsters, The Island of Blood starter sets allows you to field an army of High Elves against the Skaven, a race of giant rats. The 74 models exclusive to this box include Elves on horseback, an Elven prince riding a giant griffon, Skaven ogres and a whimsical cannon strapped to the back of a giant rat. Warhammer 40K inhabits a universe in a far off future plagued by armies in endless intergalactic planetary war. 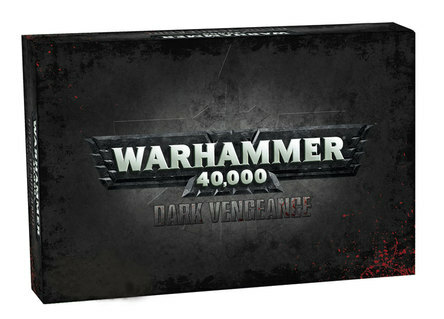 The dark vengence starter set gives you 48 plastic miniatures depicting the Dark Angels against the Chaos Space Marines. Theses figures come armed to the teeth with gruesome hi-tech weapons and clad in enormous suits of armor. A squad of bikers and a walking death machine armed with laser cannons and giant claws round out the armed forces.